So firstly I have to apologise for the lack of posts over the last 2 months, if you’re following me on facebook then you will have had a few updates with ideas, but I haven’t really had time to sit down and write out the recipes I’ve trialed & developed as I have gone back to work and while technically it’s part time, the co ordination has taken some negotiating as anyone with small children will know. Anyway, I am back and I will be making time for at least 1 post a week, I figure I can definitely handle that and hopefully more. So given we in Melbourne have been having some warmish weather – although as I am typing a cool change is coming through with large rain droplets & that gorgeous smell that comes with rain on a summer day and blowing away the heat. Hubby has had a 4 day weekend this week so we’ve been having salads for lunch. Zachie wanted to try some snow peas and I have been thinking of a way I can include these in a meal as we aren’t really a stir fry family, here is my version of Salad Nicoise. 1 Large tin of Tuna, drained. Slice the snow peas into small pieces & blanched in lightly salted boiling water, leave them in for a minute and then drain and refresh in iced water to stop the cooking process. Put the eggs on to boil – approx 7 mins depending on whether you prefer them hard or soft. In a morter & pestle crush the garlic, add salt & pepper to taste & the anchovies, mash it all together and add the olive oil with enough vinegar to taste, adjust the seasoning as required & set aside. In another bowl mix break up the tuna, add the sliced capsicum, tomatoes & lettuce & snow peas pour over the dressing and mix well & place onto or into your serving bowl or platter. Peel the eggs and cut into halves or quarters, arrange over the salad and season lightly. Serve with Crusty bread if desired. 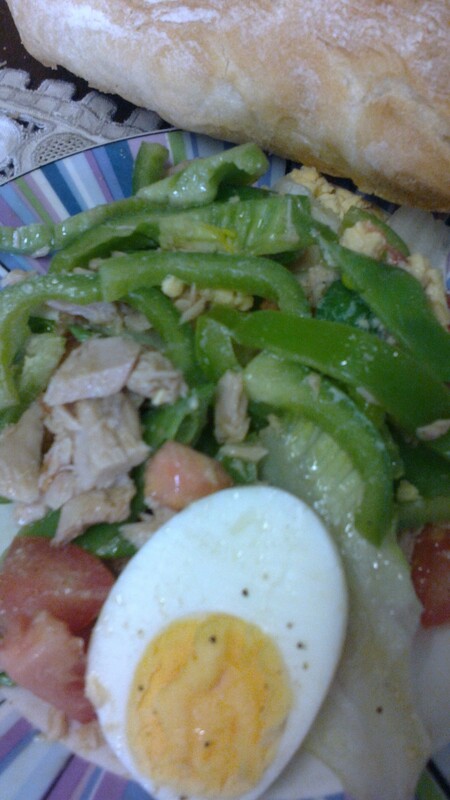 Yesterday we also made a tuna salad, but had avocado & cucumber in it, it was equally delicious! We have an abundance of lemons at the moment, I have made about 20 jars of preserved lemons & still have loads left over so seeing as we need to use them this is a wonderful way to do so. I have made this cake quite a few times and it’s become a staple in our house, my hubby LOVES a lemon cake and I was making a pound cake, but it’s very dry for some reason so we’ve moved to this recipe which is divine, it’s light & fluffy, moist & very lemony which I believe is the whole point of a lemon cake. So I/we highly recommend this recipe and I hope your family enjoys it as much as we do. The quantities below are not doubled as I make it. Grease a 24cm square or round tin and line with baking paper, pre heat the oven to 170 degrees celsius. Place the butter & sugar in your mixing bowl and cream together until very pale & fluffy. Add the lemon zest and mix, add the eggs one at a time mixing well between each addition. With the mixer running slowly add the milk, then add the flour & mix well ensuring you scrap the sides, but don’t over mix. Transfer to the prepared tin & bake for 35 mins or until golden & when pricked with a skewer it comes out clean & dry. Now Joyce apparently pours over a lemon syrup which will obviously increase the lemonyness we don’t, but I will include it as it does make it a bit special especially if you’re making it for a special occasion. Combine 100g caster sugar & 100 ml of lemon juice in a saucepan and bring to a simmer for 2 minutes ensuring the sugar is dissolved. It’s best to do this while the cake is baking. 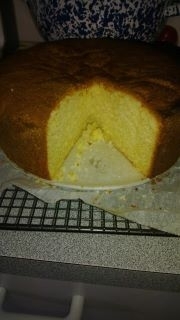 When the cake is ready remove from the oven but leave in the tin to cool for 5-10 mins. Use a bamboo skewer to pierce the cake all over then slowly spoon the syrup over the cake and leave until completely cool before turning it out. P.S. I always double the recipe and the cake pictured is it. Double the recipe, line the tin & if you have one, use a springform tin. Enjoy!